Module Four is meant to provide a brief introduction to two of our themes: the richness and diversity of African history, and Africa’s global connections. Through a series of four map images, you will be exposed to African history from ancient times to the present. In addition, you will see the various and important ways that Africa is connected to the rest of the world through trade networks and the exchange of ideas, knowledge, and beliefs. It should be noted that the information presented in this module is a smattering of events to give the you a sense of a few things that were occurring in Africa during broad periods of history. A more comprehensive study of African history will be done in a later module. 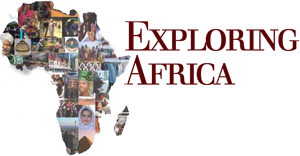 For now, the emphasis should be on introducing you to the diversity, richness, and global connections of the African continent. This module is meant to be a computer lab exercise, so you should work on your own computer. Two worksheets accompany each map activity: a timeline and a graphic organizer, which you should fill in as you explore the maps. Afterwards, you should return to a class discussion. If it is not possible to do these activities as a class in the computer lab, the maps and texts can be printed as handouts or overhead projections and used in the classroom. In this module, the discussion is included as a separate section. Click below to find the discussion for each activity.